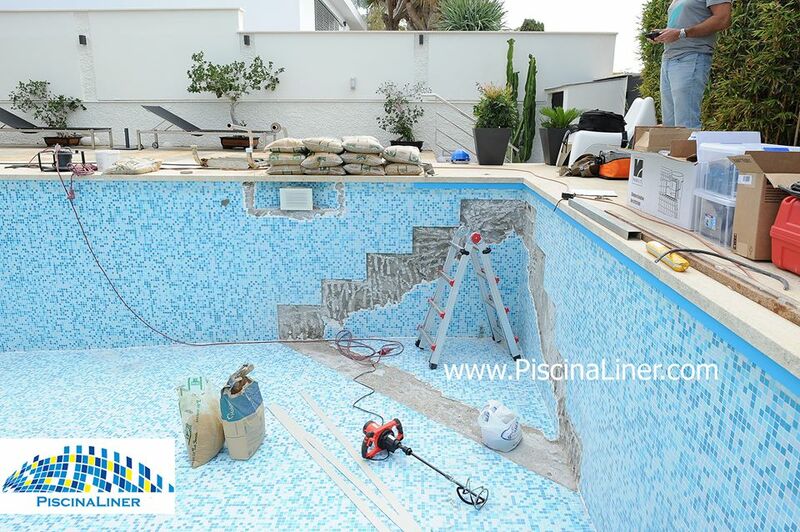 Installation of a swimming pool heating system is something that has to be considered carefully. It is a considerable investment, so the heater chosen needs to be reliable, with parts availability and be large enough to heat the volume of water. 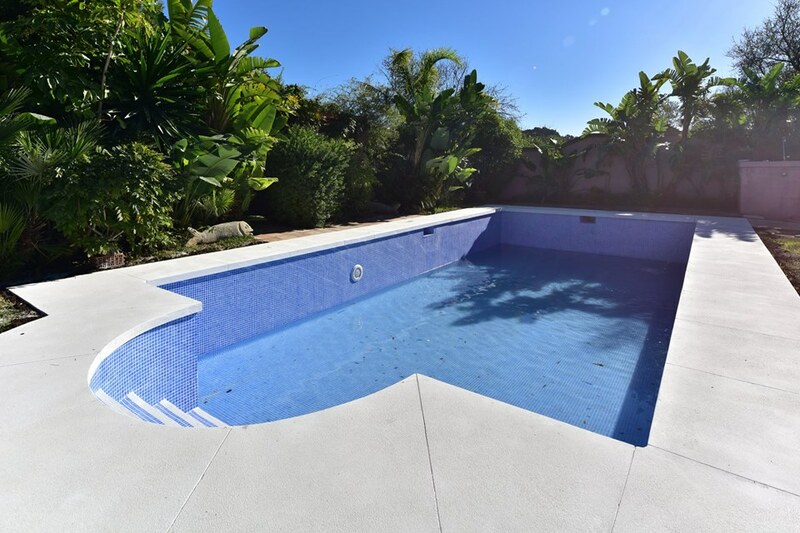 We normally specify a heater slightly larger than needed, which allows the pool to be heated quicker and be used for longer without a cover of needed. When choosing a heat pump for your swimming pool the following need to be considered. Is the pool for domestic use, or will it be a holiday rental? 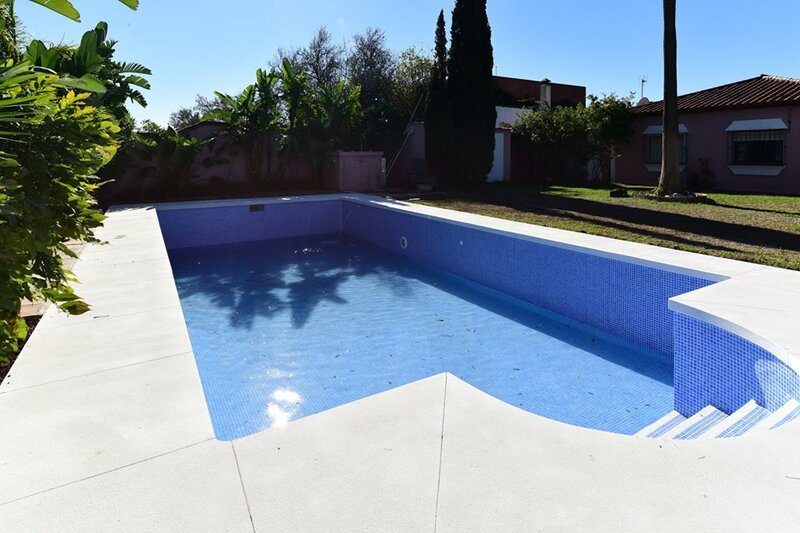 If the pool is domestic use, it is unlikely to be used in winter months. 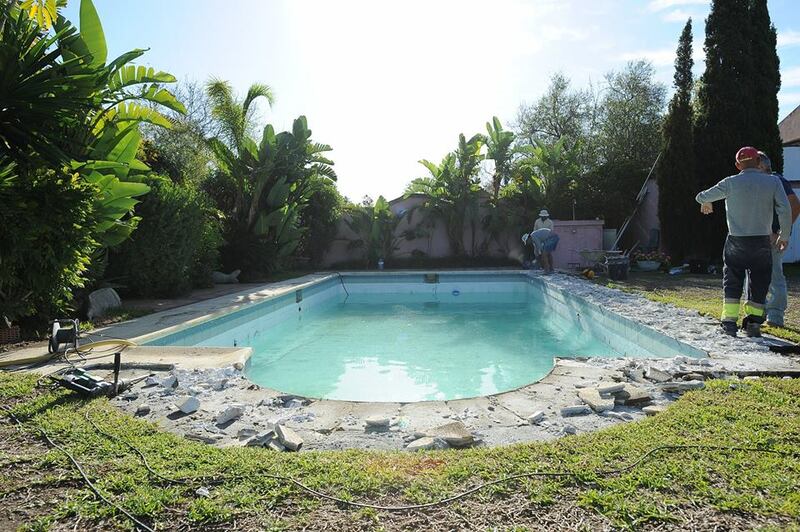 If the villa is to be used for year round rentals, holiday makers will want to swim year round. Will a cover be used. Again, the use of the pool needs to be considered. 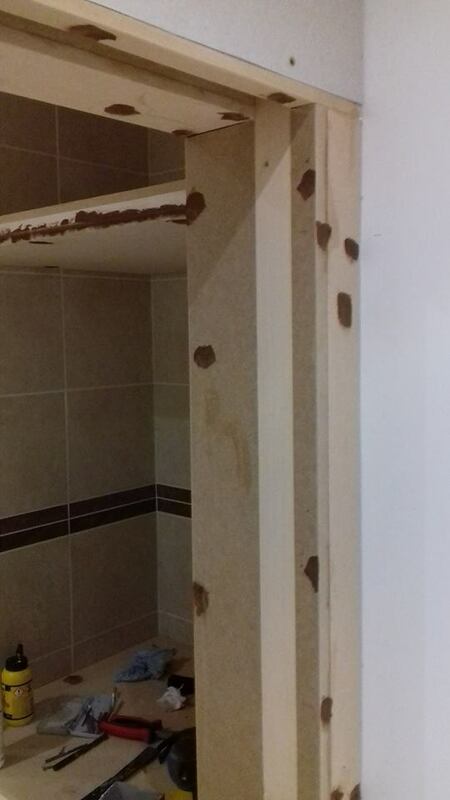 Rental clients on holiday are unlikely to replace the cover after swimming, whereas the home owner will. This has a bearing on the size of the heater required. Location of the pool. Is the pool exposed to wind, or sheltered? Altitude. 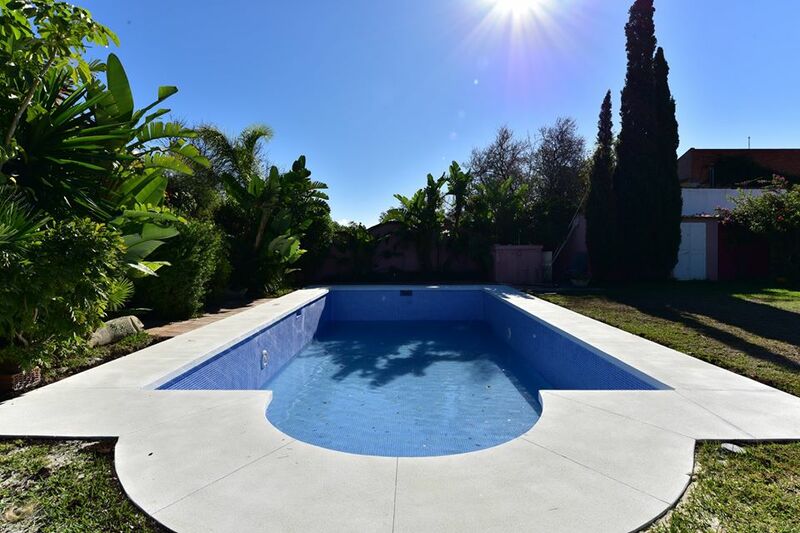 A pool heater in Mijas Pueblo will need to be bigger than a pool heater in Fuengirola for the same size pools. There are some other questions that we ask clients about their reasons for choosing a pool heater. Once we have this information, we can specify the most suitable heat pump for the pool. Latest technology pool heaters now use multispeed inverter compressors and variable speed fans to improve running costs. These technologies also make the machines much quieter. Out with the old and in with the new inverter pool heater A+ efficiency. 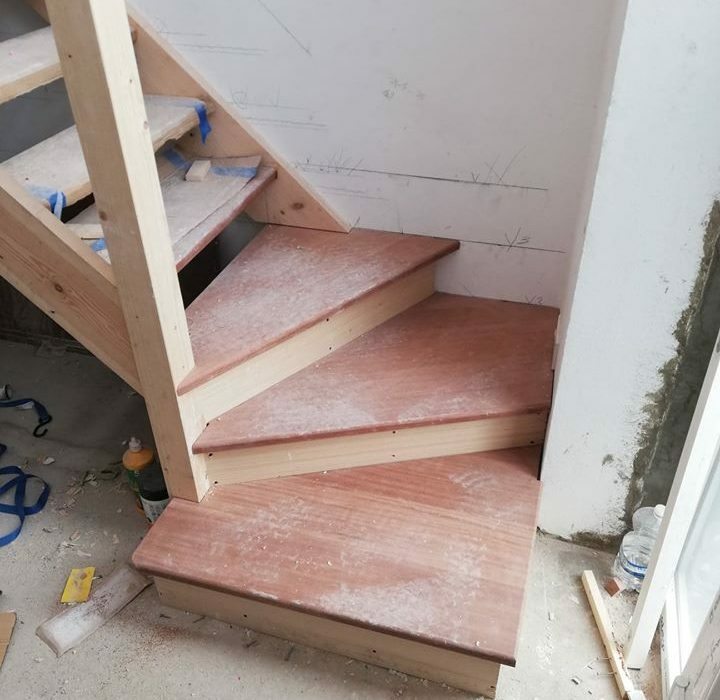 Custom made wooden staircase, townhouse renovation project. 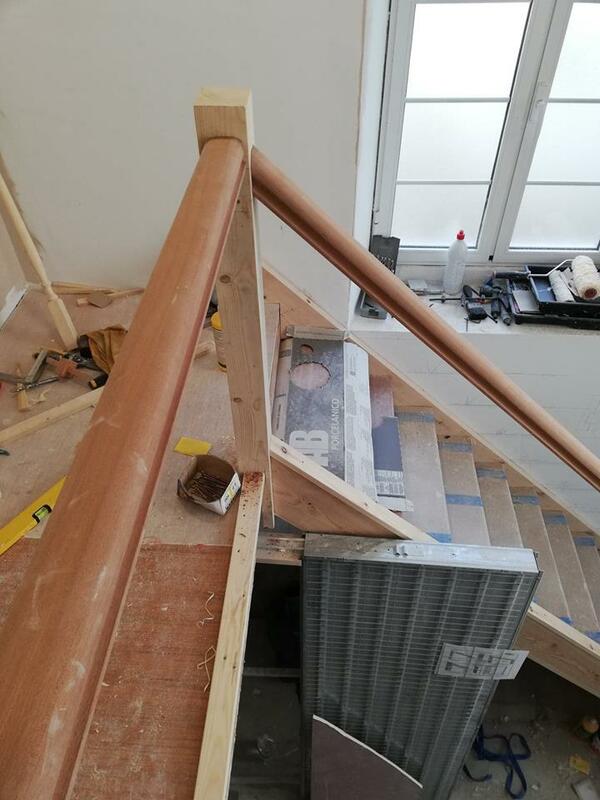 In this example of works, we are showing a custom built staircase by our carpenters. 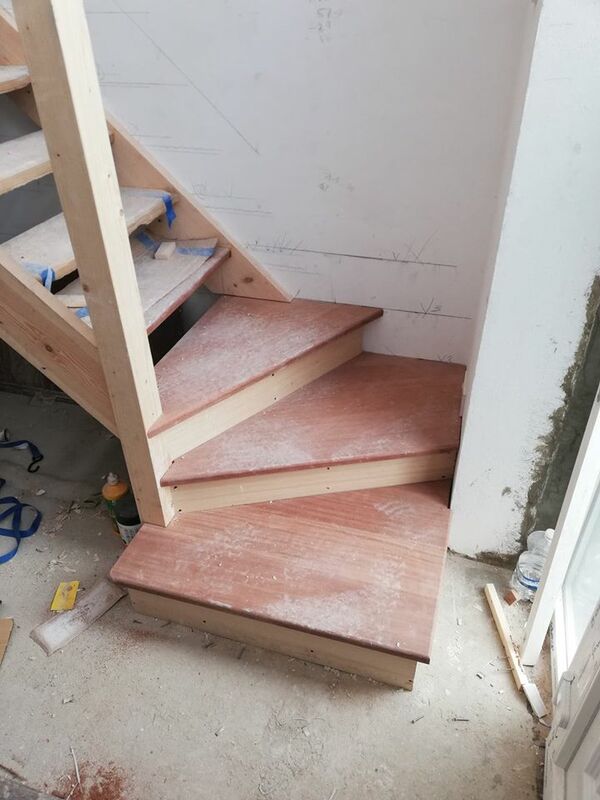 The carpentry team made the staircase from scratch to the customers design requirements. 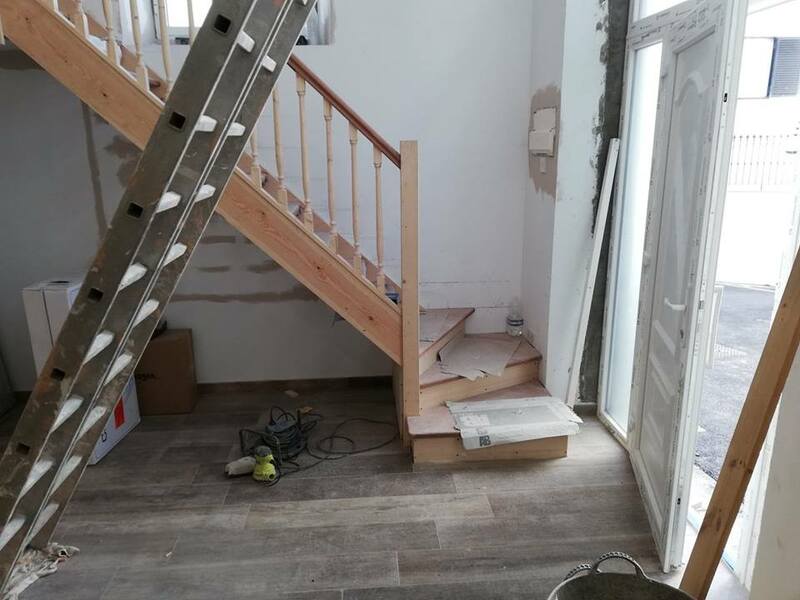 This was part of a renovation project of a 2 storey townhouse. 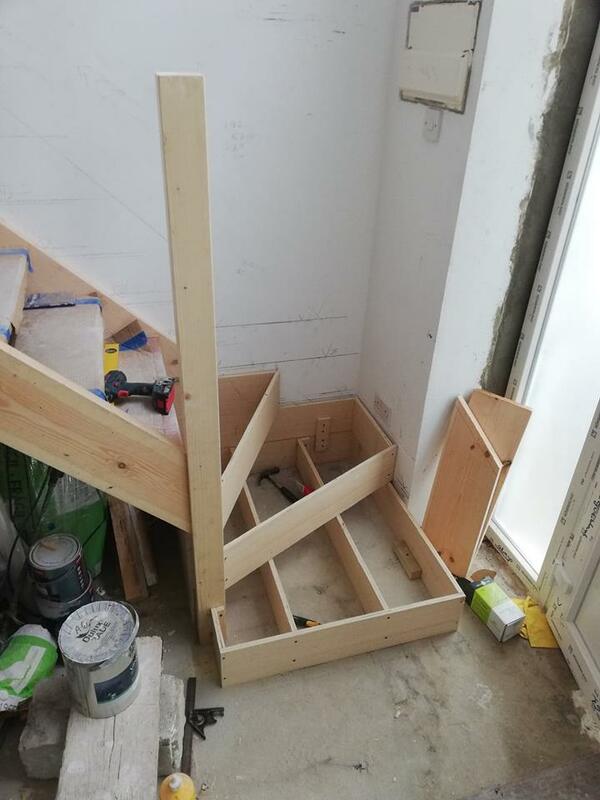 The staircase was moved to give more space and more light. 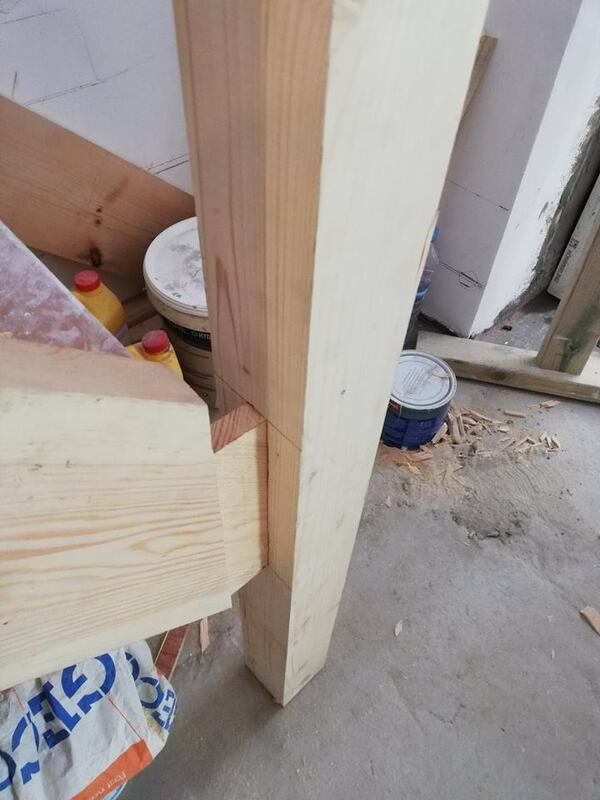 In this carpentry / renovation project, the clients wanted the finished building works to be a mix of modern and traditional. 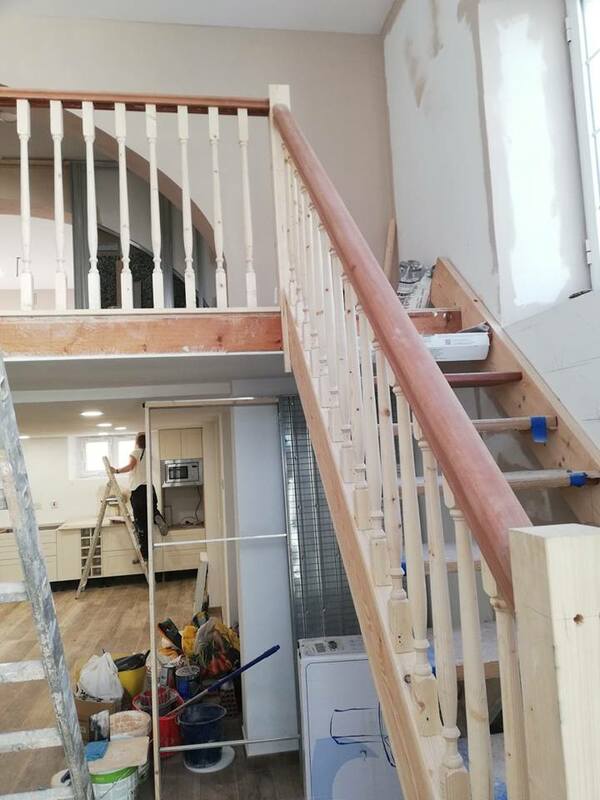 This staircase once finished will be painted white. The main structure is pine. Pine is chosen as it is an economic material with good strength to weight characteristics. For the treads of the stairs, solid mahogany for it’s hard wearing nature and beautiful looks. 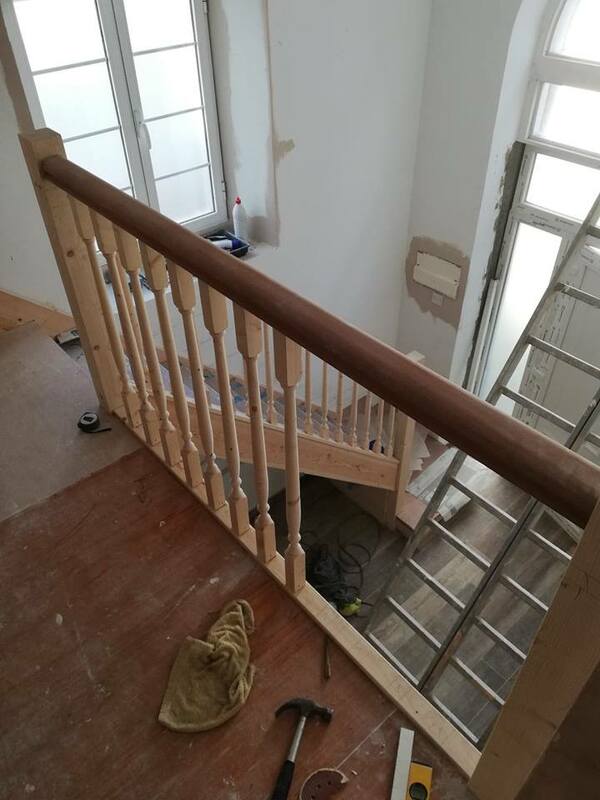 The balustrade is pine, with the handrail in mahogany. 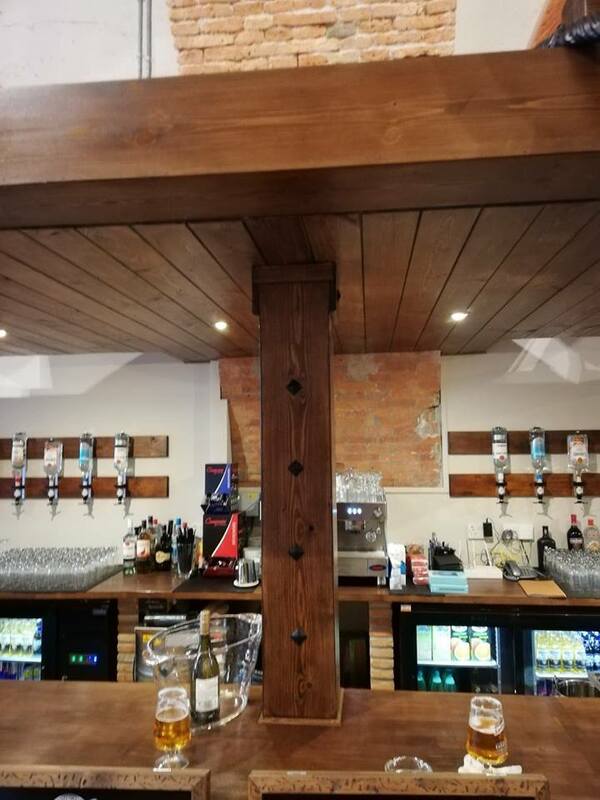 If you need any type of carpentry, from wooden staircases, to bars, built in cupboards, wooden work tops, outdoor bar areas, pergolas, car ports… any thing made from wood, get in touch with us today to see what our carpenters can do for you. Custom built wooden bar for brewery restaurant by our carpenters. 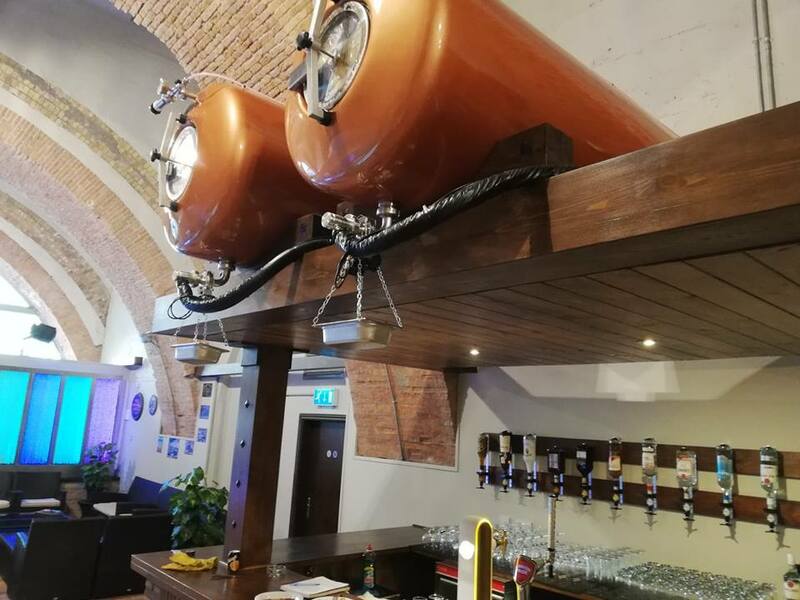 This custom made wooden bar perfectly compliments the surroundings. This was quite an involved project, as the weight needing support was quite significant. 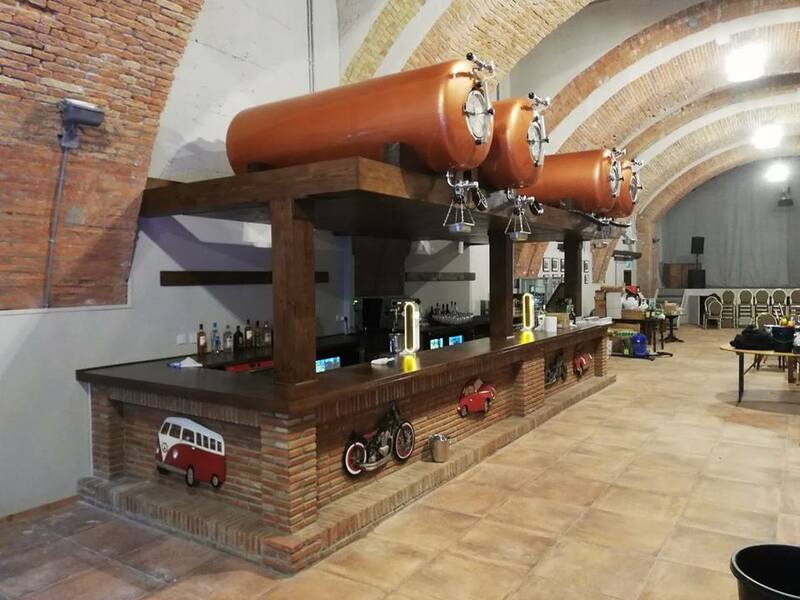 A steel structure was made first, all welded and treated, then all bolted and welded into position to take the main weight of the barrels. 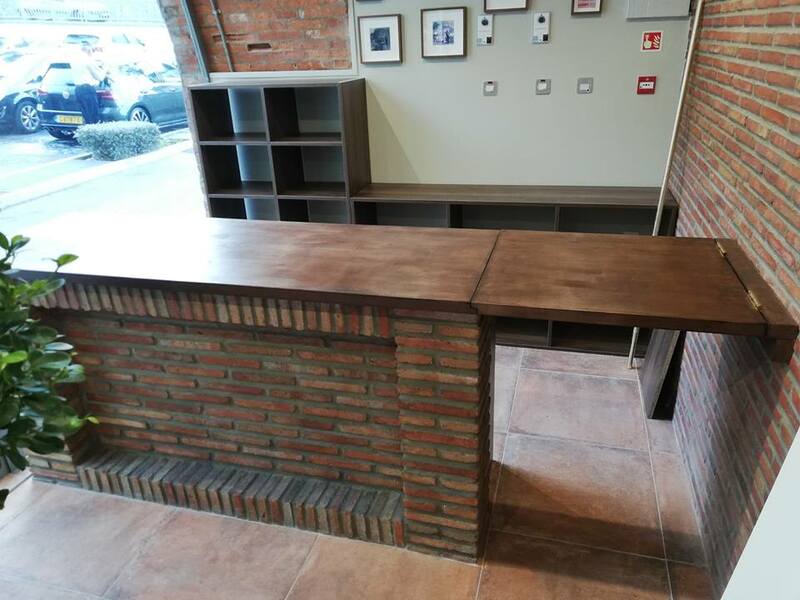 Around the base of this, we built the support of the bar top from rustic clay bricks. 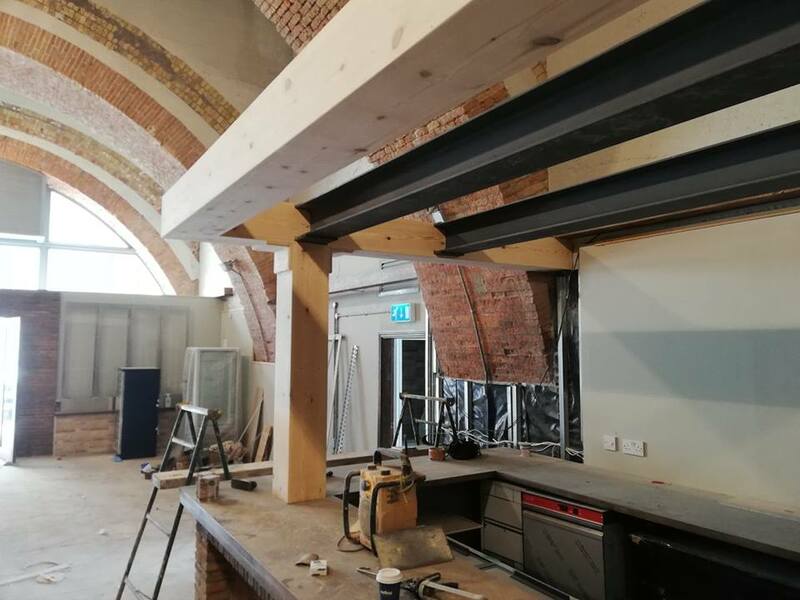 On top of this support is the solid wooden bar top, the wooden pillars that provide decoration and support for the tongue and groove ceiling. 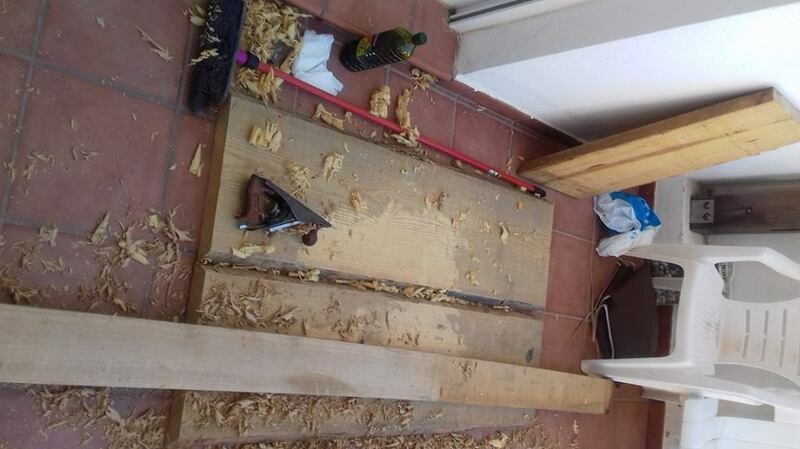 Once everything was completed, it was all sanded, sealed and stained. 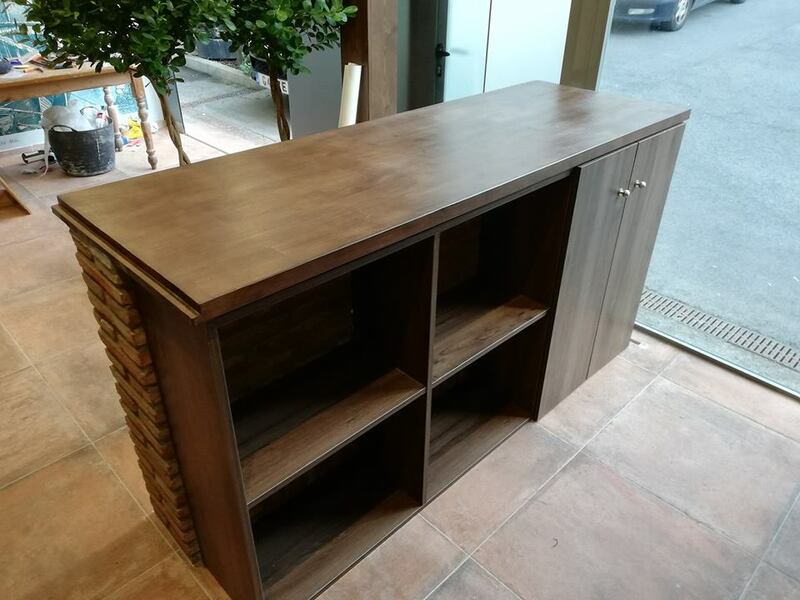 This type of custom built wooden bar can be used in restaurants, bars or be equally at home as a feature in your entertainment areas, such as home bar, pool room or in a room at the side of the swimming pool. 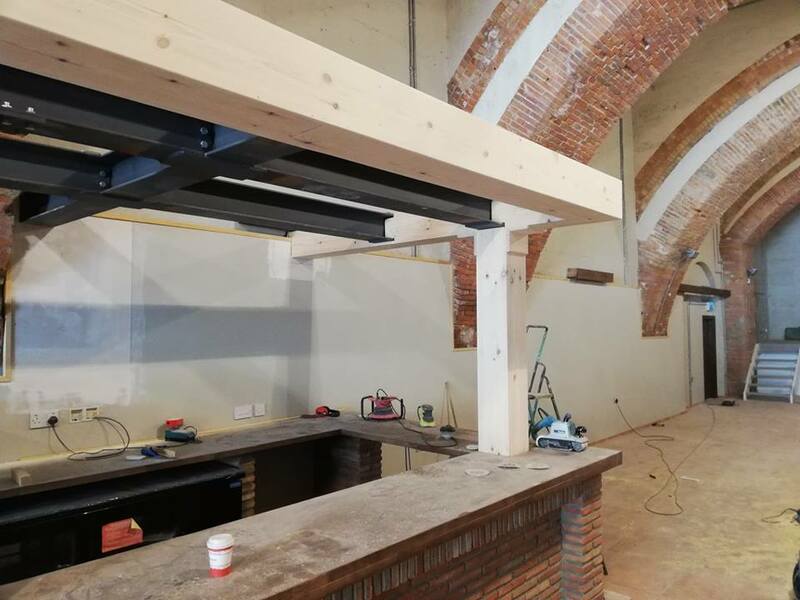 Our carpenters can make bars to suit any space, whether commercial or private, new build villa, or recently renovated apartment. Our team is able to do all types of building works. We try to showcase projects that are different from the norm. 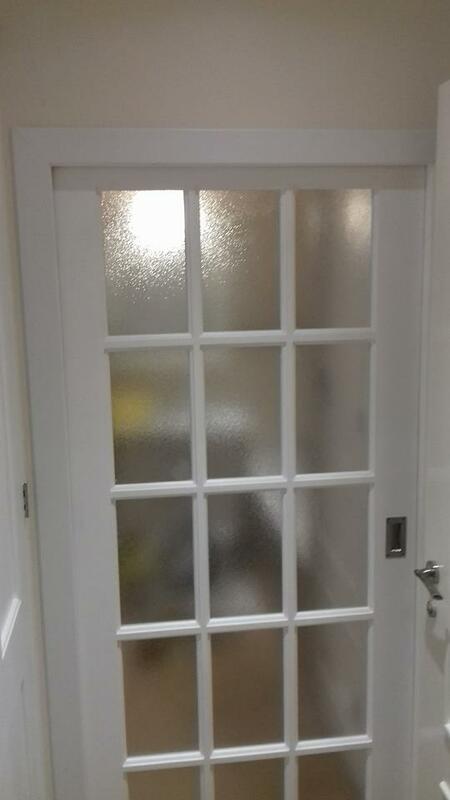 We can fit out bars, shops, restaurants as well as work on domestic properties, such as villas or apartments. 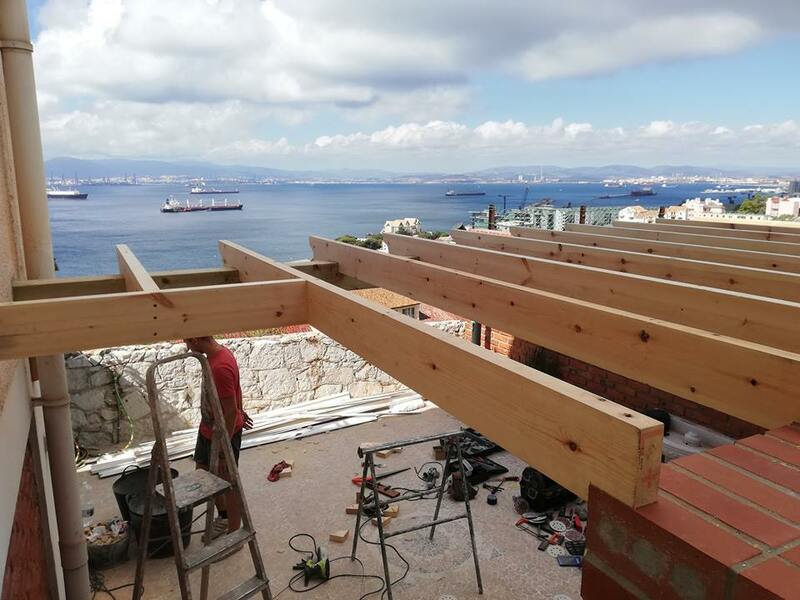 This project was in Gibraltar, however we prefer to work in Spain. If you would like to discuss any project, please get in touch. 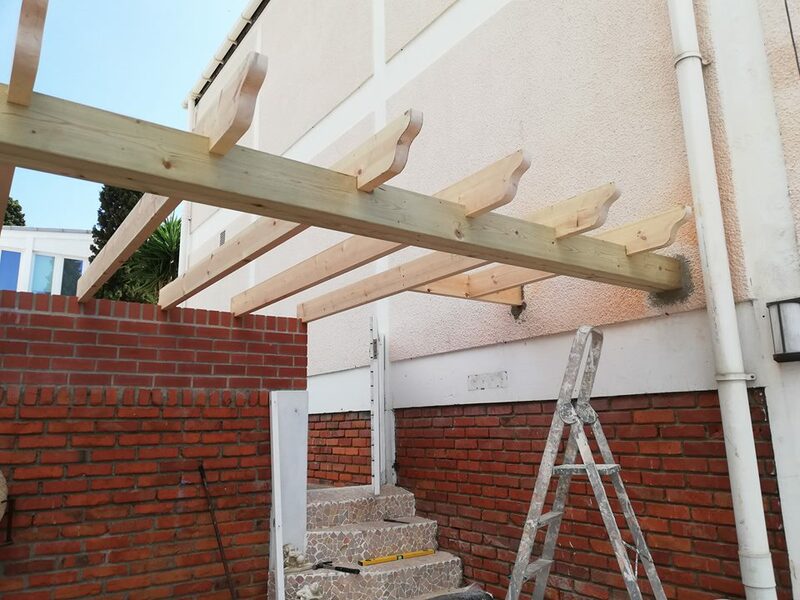 We work with building all along the Costa del Sol, from Malaga to San Roque, covering Mijas, Marbella, Fuengirola, Estepona and inland to Alhaurin, Monda, Coin, Ronda, Gaucin, etc. Do you have small difficult spaces, where there are doors are needed or shelves needed, but there just is nothing available in the stores? 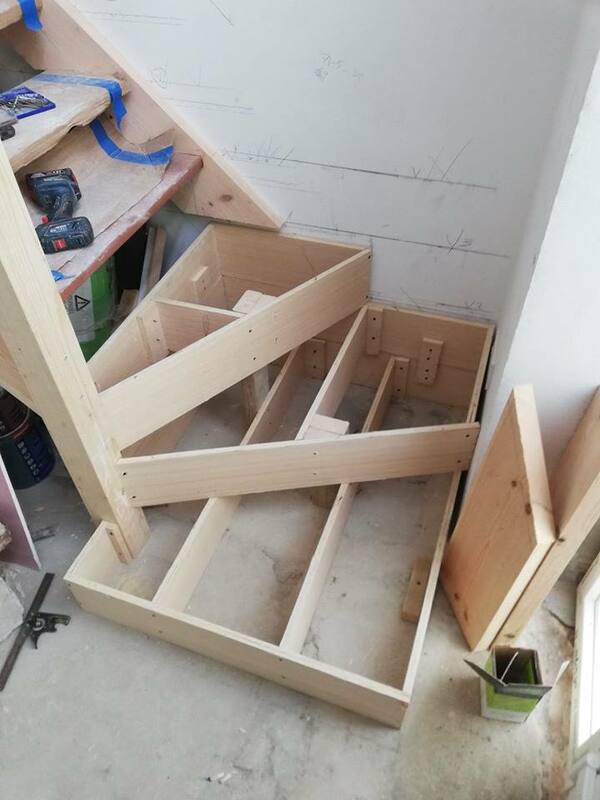 Our carpenters can custom make these items to suit the space available. 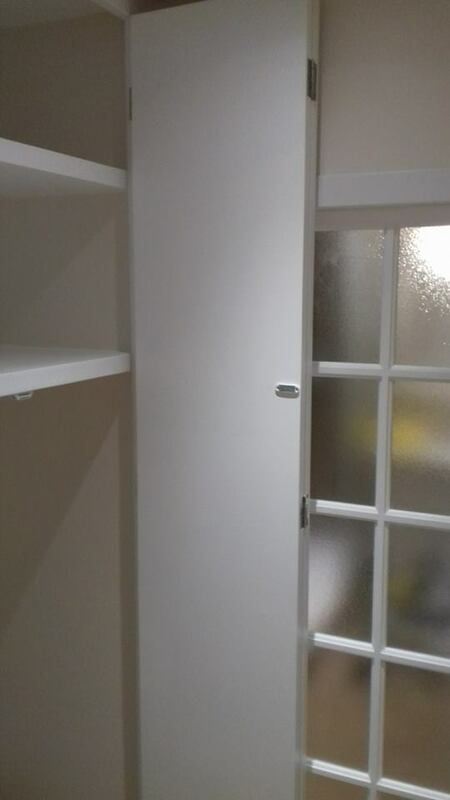 Interior space can be maximised by using custom made doors, wardrobes, cupboards and so on. 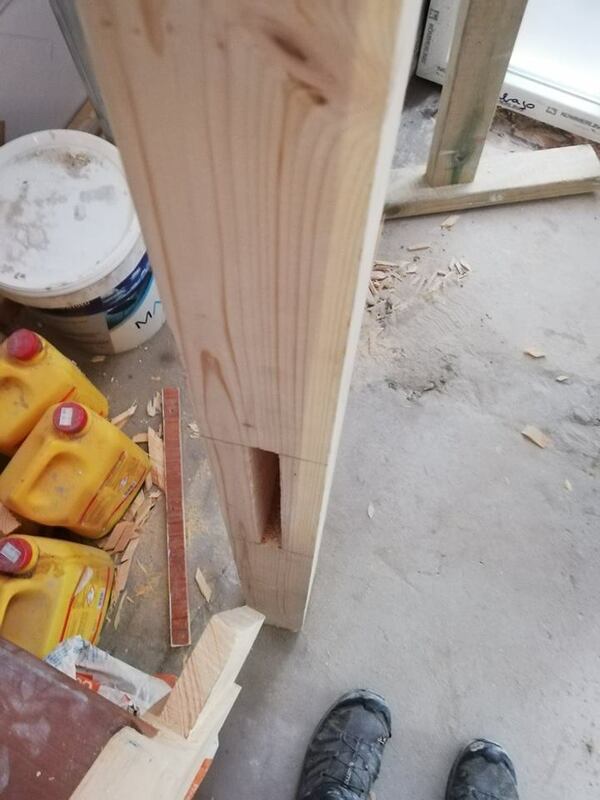 Off the shelf carpentry just won’t do. 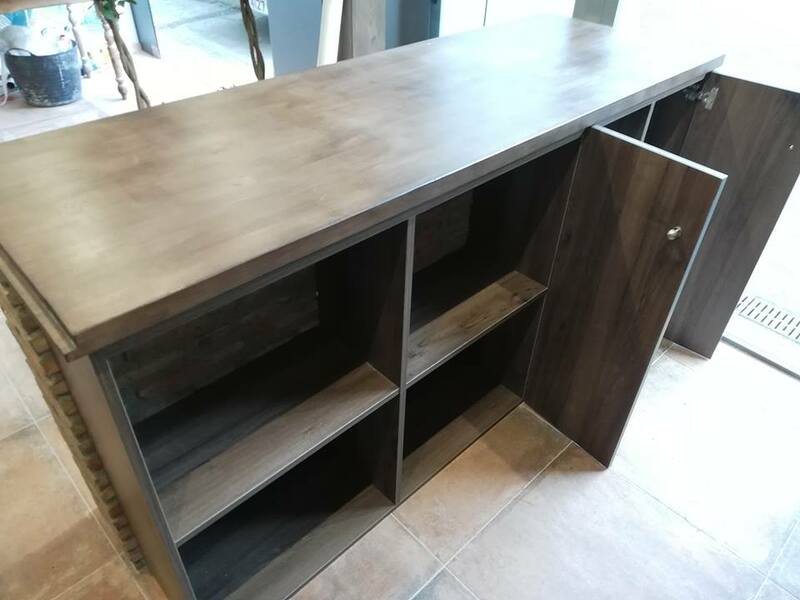 If you want a truly unique item, we can also custom make furniture, such as tables. 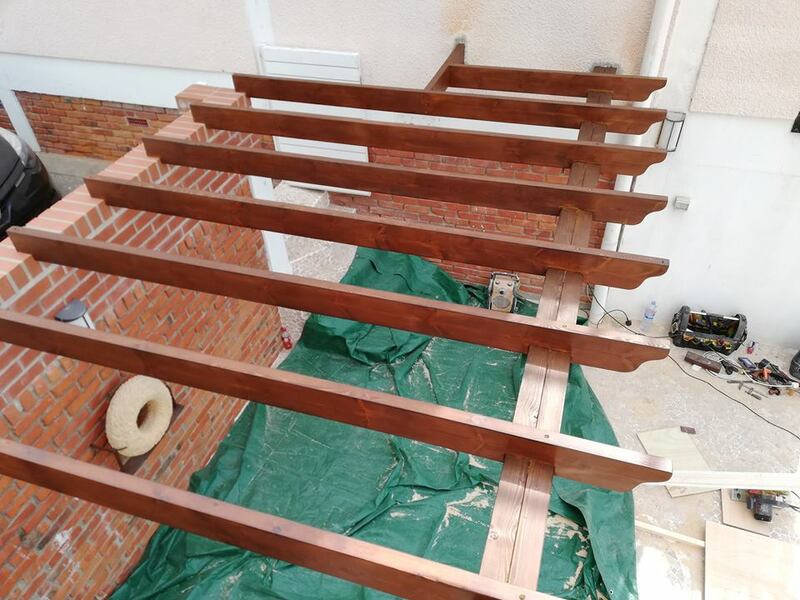 In these pictures we showcase some small projects of interior carpentry work from some of our building projects on the Costa del Sol. 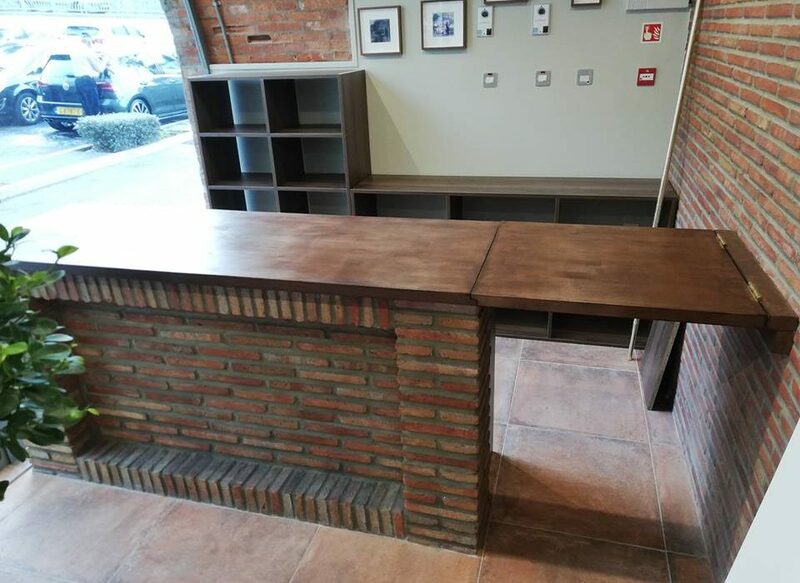 This was a small custom built hardwood bar unit / reception desk for a project in Marbella. It would look equally at home in a lounge, on a terrace or next to a swimming pool. 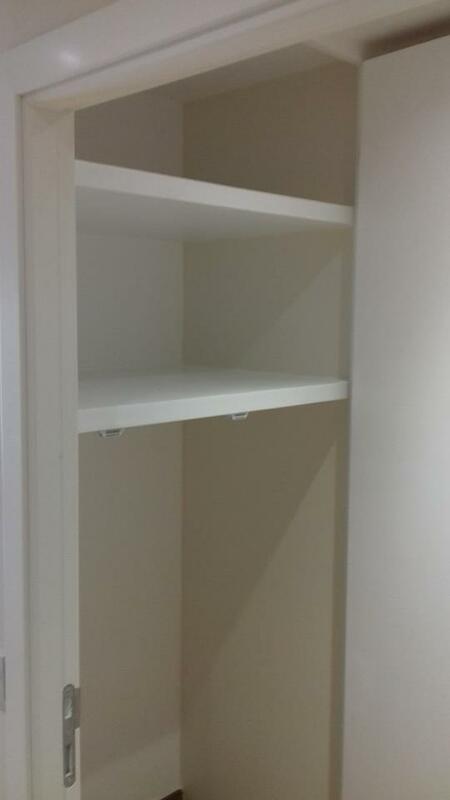 In this example, space was maximised by our carpenters creating a built in wardrobe / cupboard, with custom made doors and shelves. 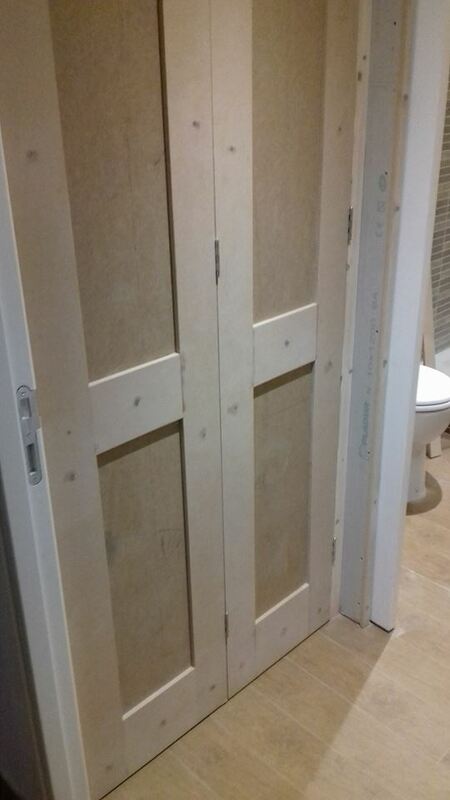 This was combined with a sliding door to ensure that space was not used up with the door opening into the room. 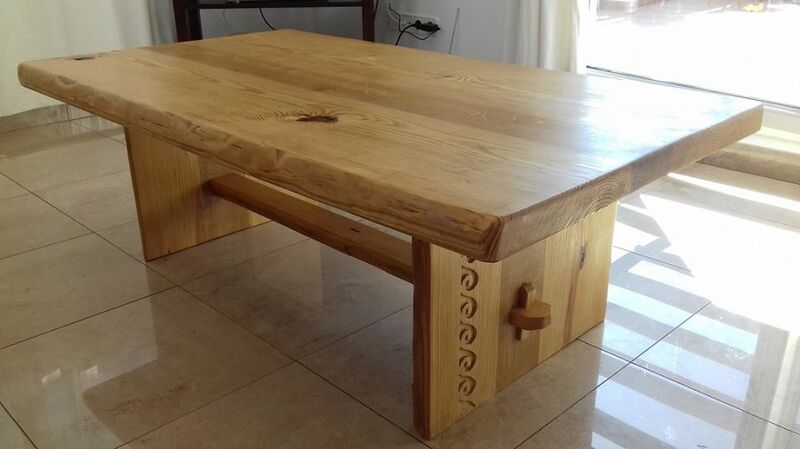 A beautiful hand made coffee table for an apartment in Mijas. 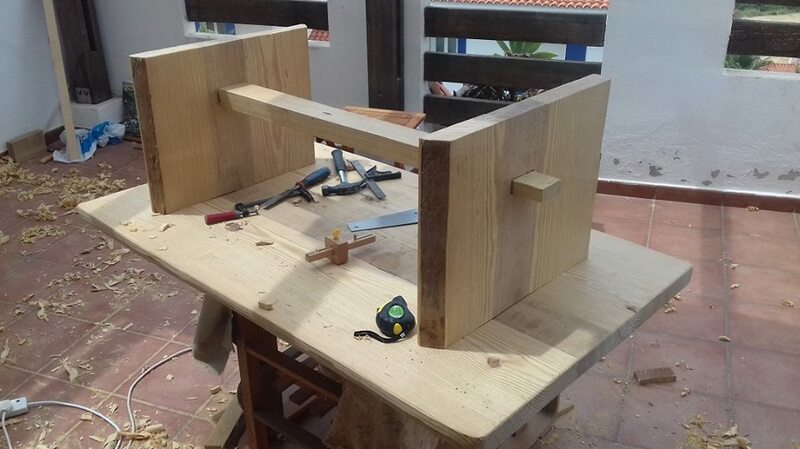 The client and head carpenter worked closely together to create this table. 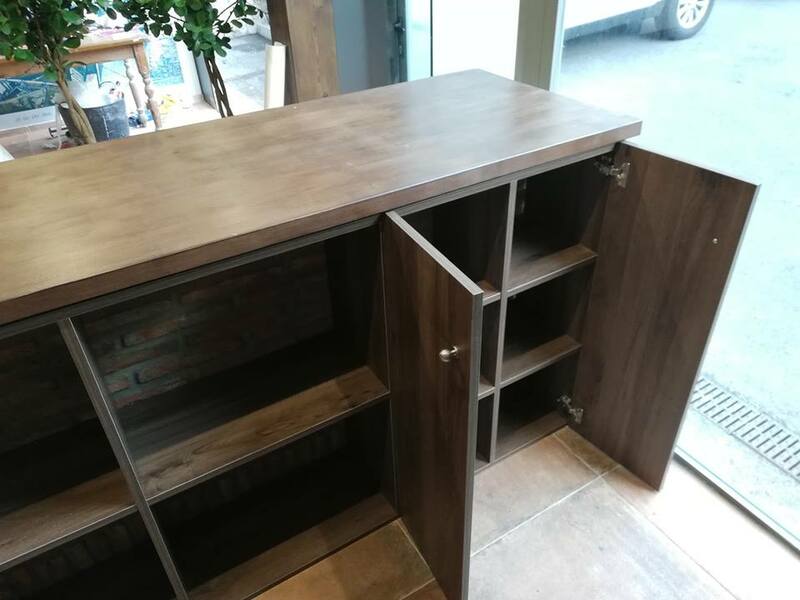 Although it is not a large piece, it is individual. No one else will have the same. 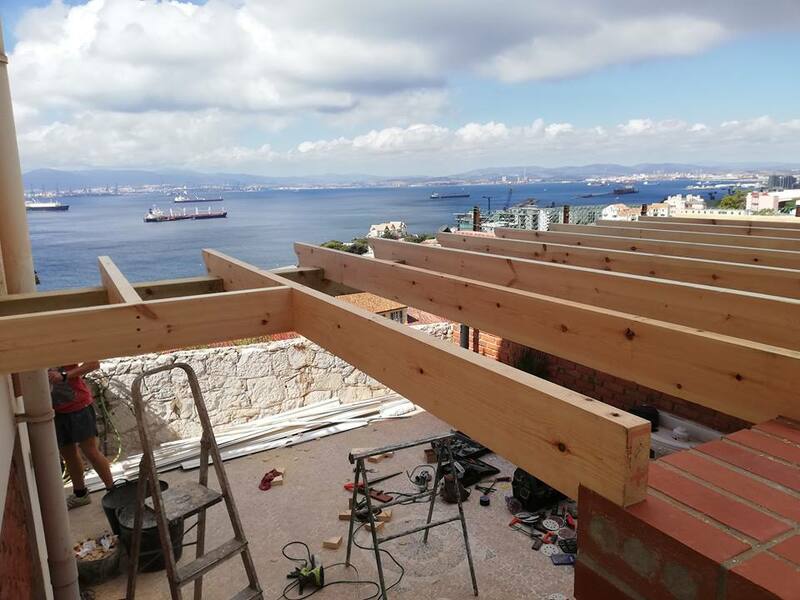 We manage building projects all along the coast, to discuss your carpentry projects, feel free to contact us with no obligation. 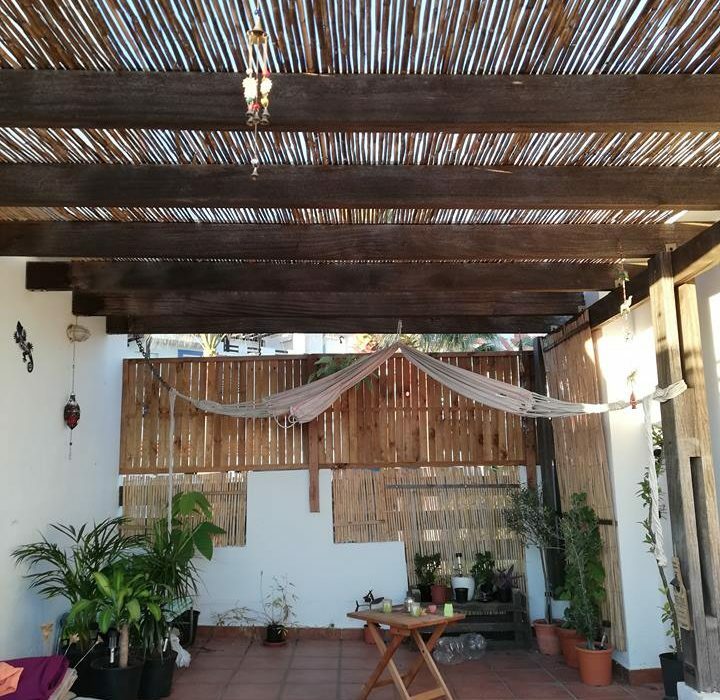 If you are looking to optimise outdoor space, wooden structures are the perfect way. 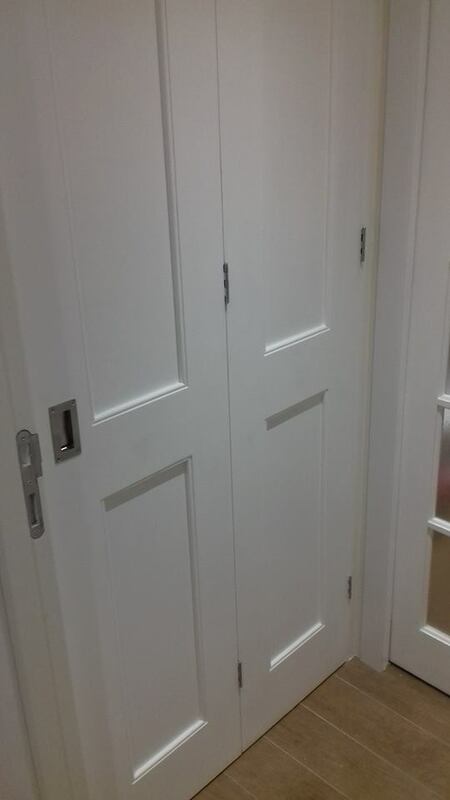 They blend well with existing decor and the wood can be painted any colour or stained. 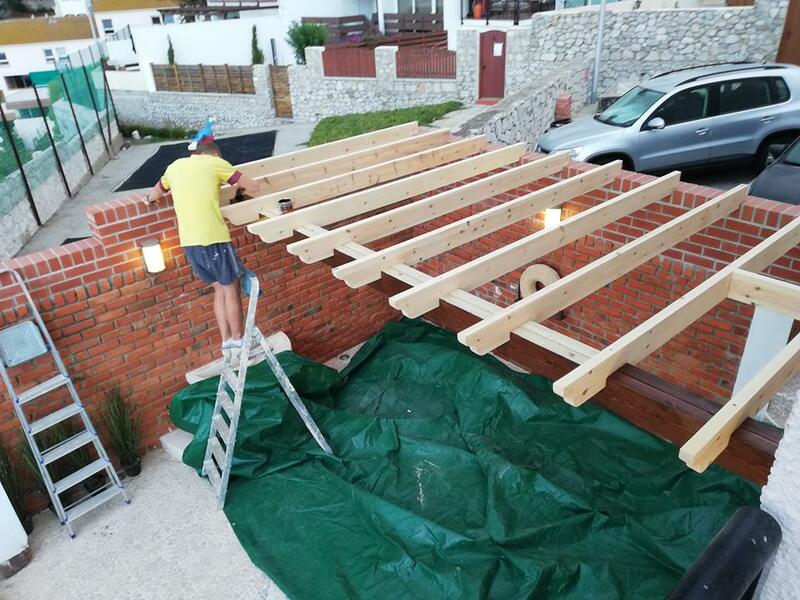 Our team of carpenters are able to create any type of structure from wood, both indoor and outdoor. Car ports, outdoor entertainment areas, decking structures, or just give some much needed shade over the dining area. 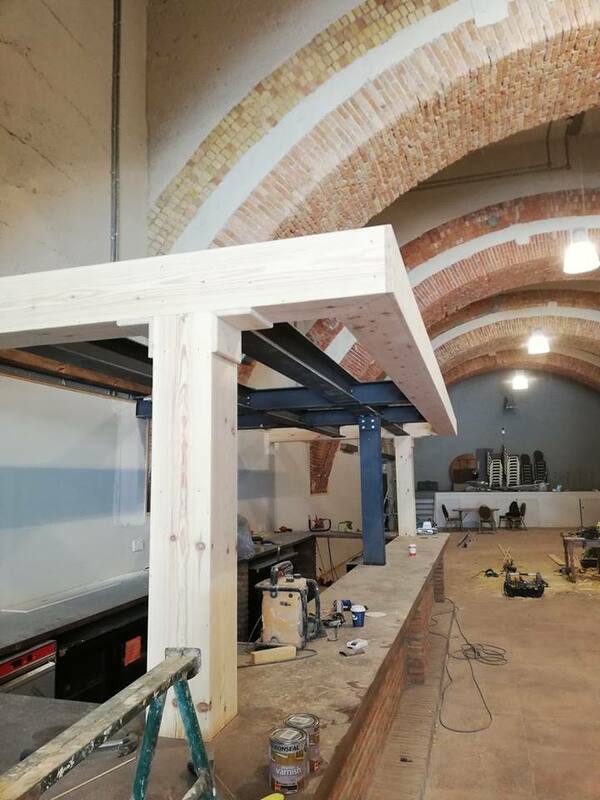 Our carpentry team can also build the bar area, outdoor dining tables. 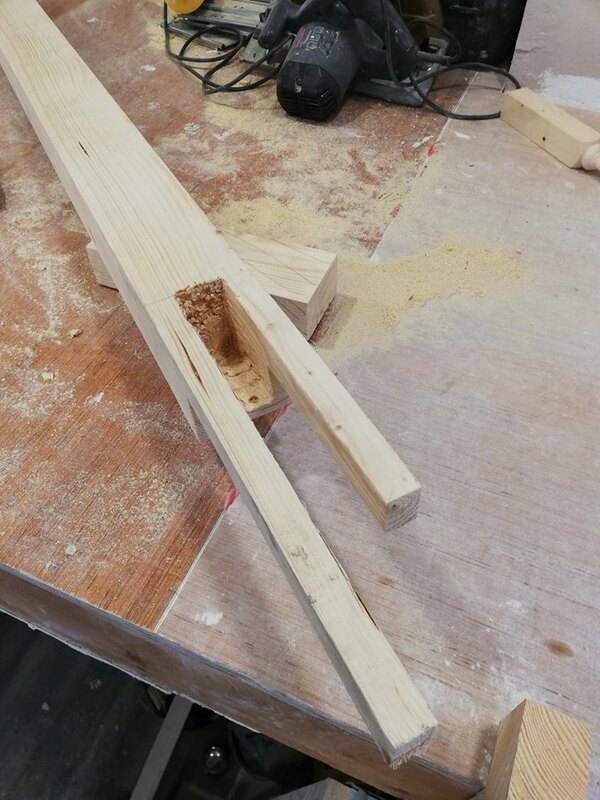 Wood is a highly versatile material and can be used to make things to all different shapes and sizes. 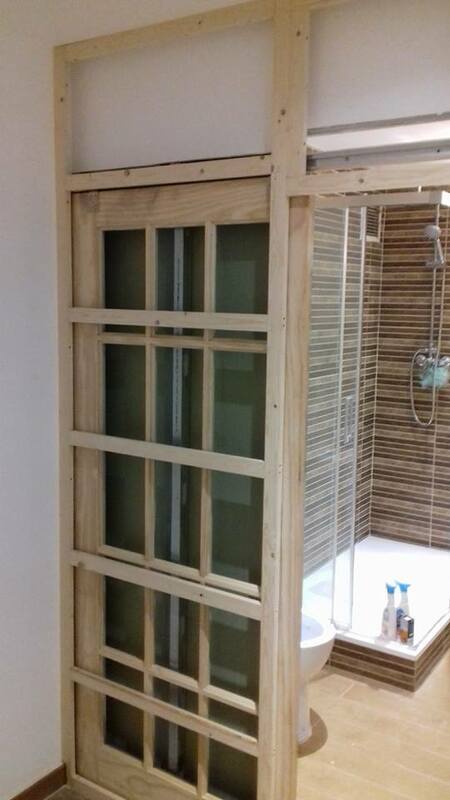 We have had clients ask for wooden shutters to cover air conditioning units and so on. 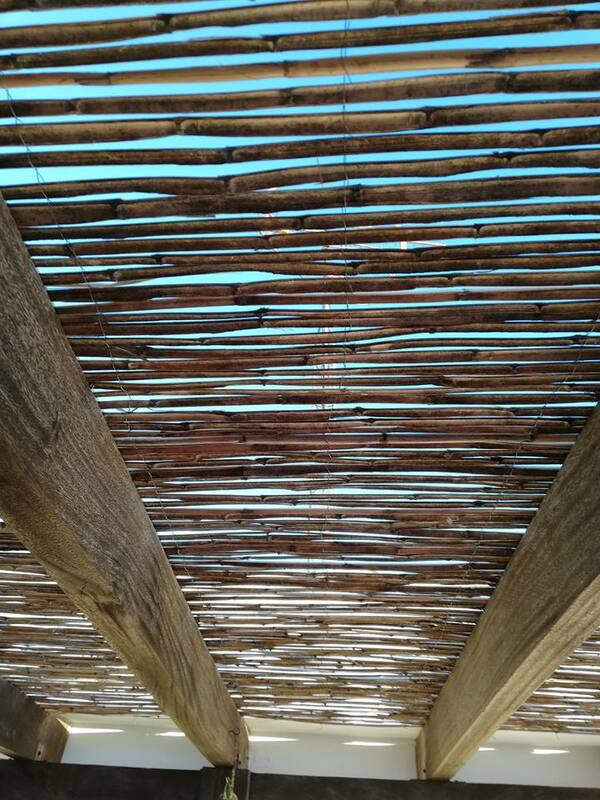 The wood used in these type of structures is treated to protect from the elements. 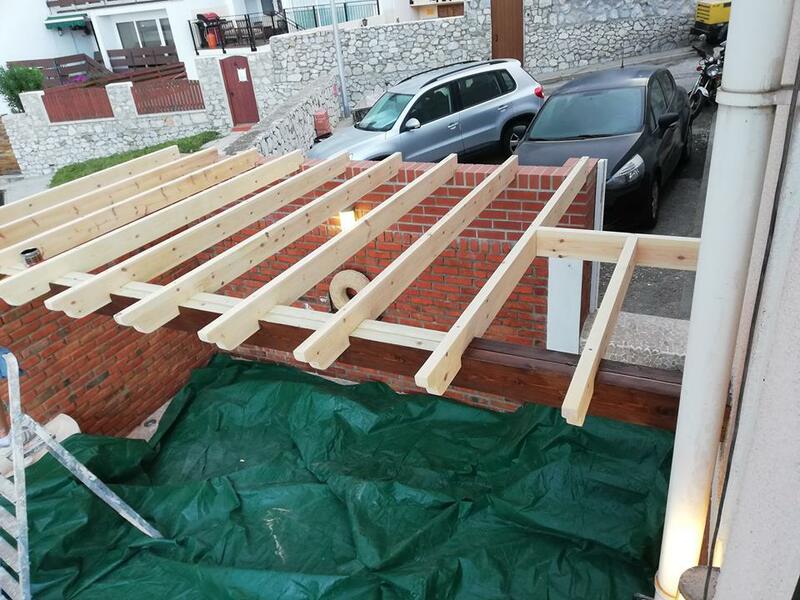 In many cases these types of wooden structures do not need planning permission, as they are not classed as permanent structures. Retaining Wall collapsed after heavy rains? 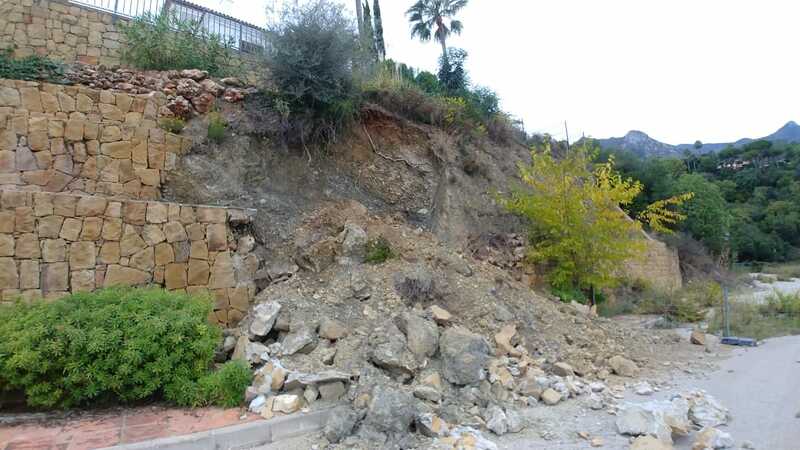 This wall was built very poorly by the constructor of the villa in Sierra Blanca, Marbella. 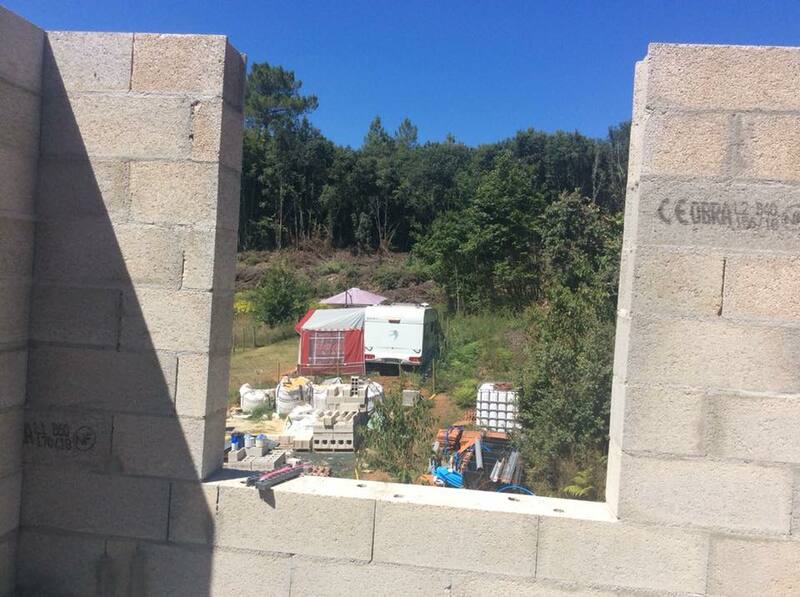 The wall was of insufficient strength to be able to support the weight of the terrain and the pool above it. The rains were torrential, above the normal average, but a structural wall should be strong enough to support it. 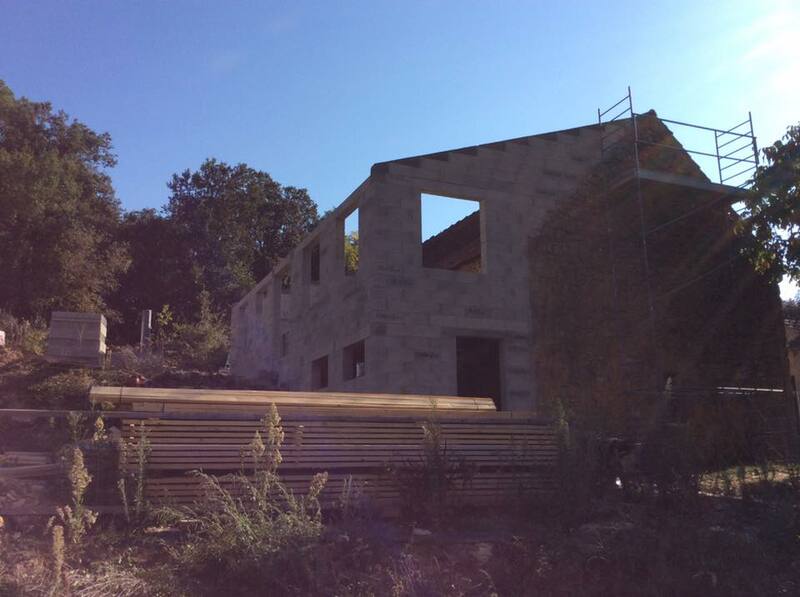 If you need help with constructing a retaining wall that won’t collapse, contact us today. 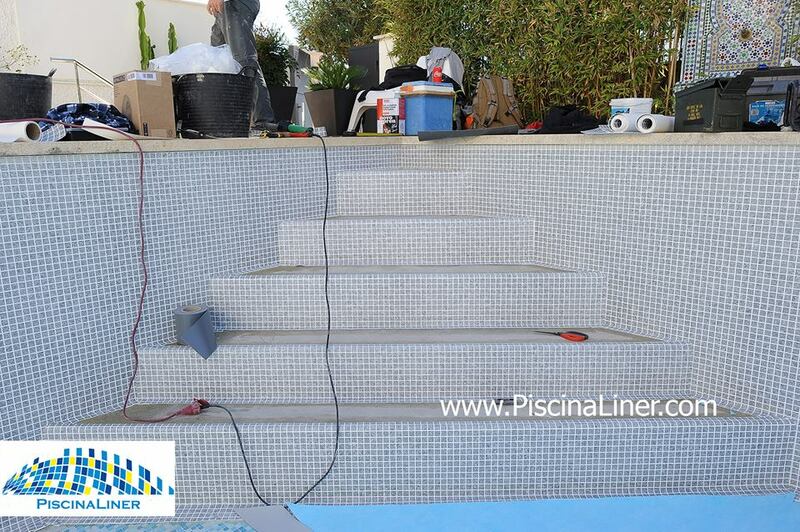 We assisted the swimming pool liner specialists here by building some steps into the pool before they installed the pool liner. 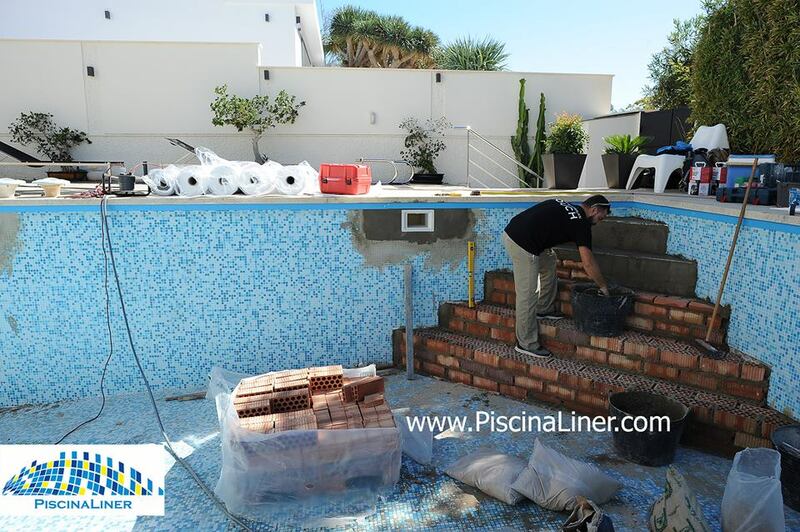 The process is the same if the pool is tiled. This is a total renovation of an old swimming pool. 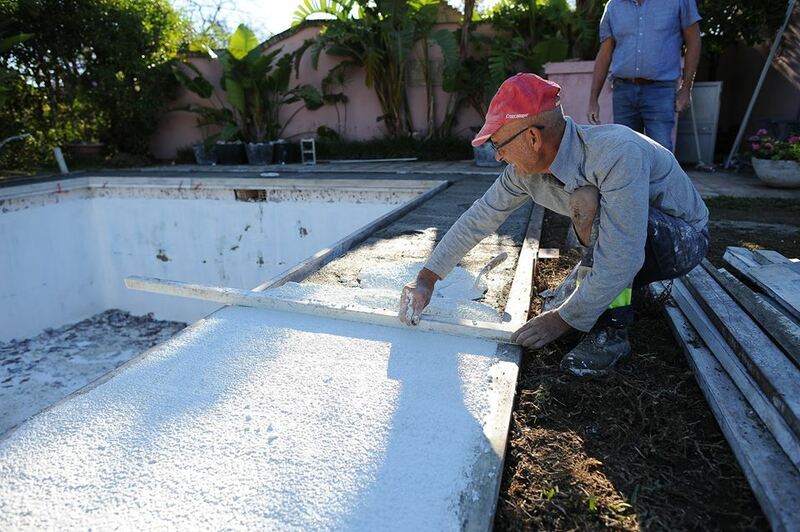 The prefabricated pool surround was breaking up and was painful for people to walk on. The inside of the pool was painted. After 30 years of paint being applied, it was looking a mess and the paint was starting to come off in patches. The first thing that we did was to demolish the existing pool surround. This waste was removed to a treatment plant. 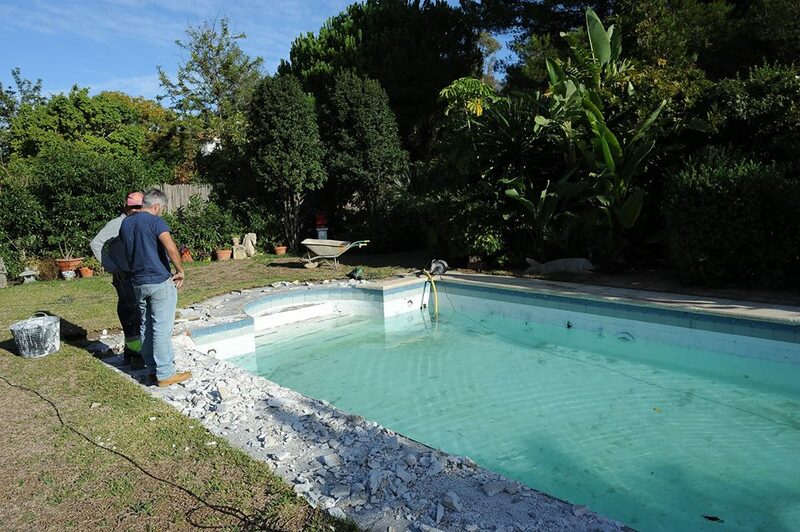 The swimming pool was then drained and allowed to dry a little ready for the sand blasting. 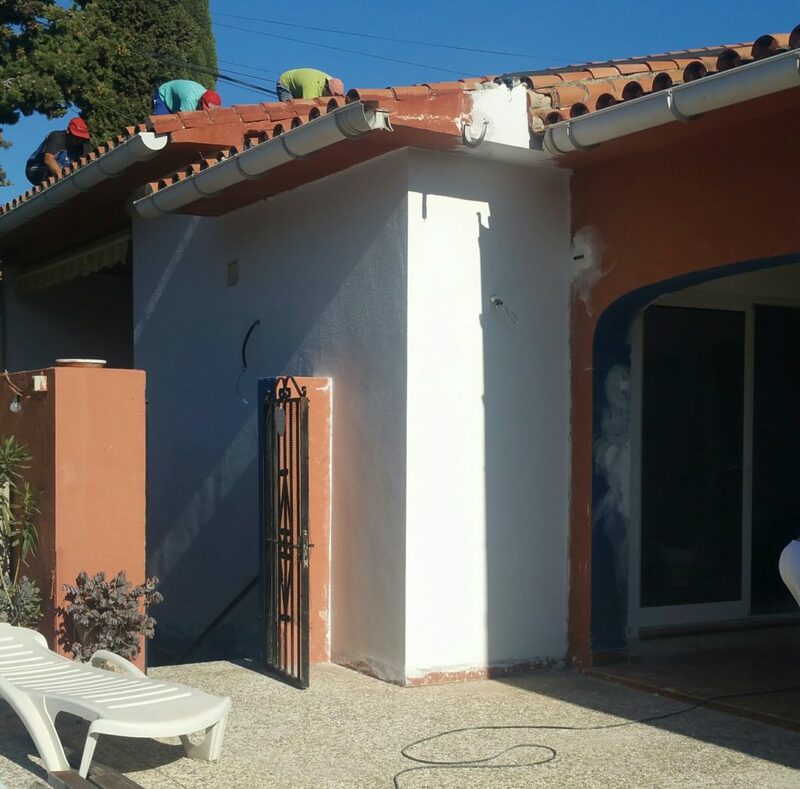 The sand blasting removes all the loose paint back to the original render and ensures that the new tiles will be well stuck. The surround is made from very hard white concrete. 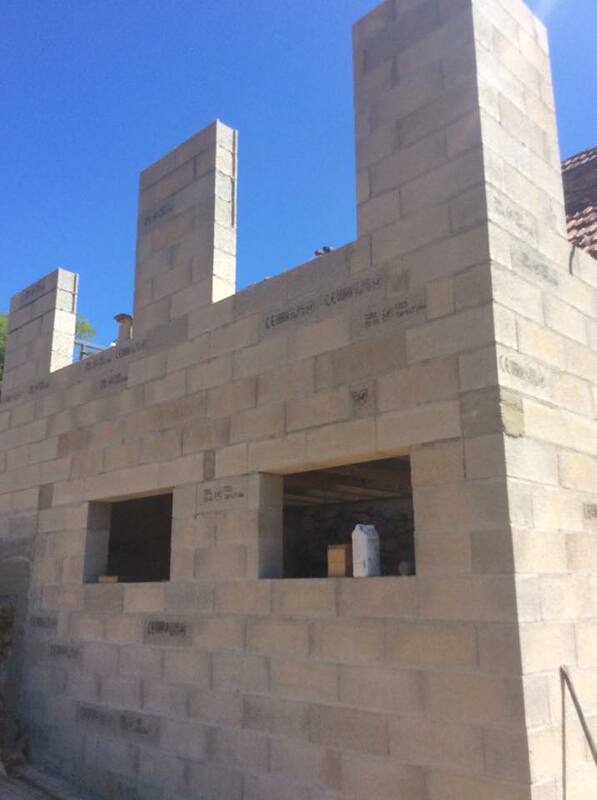 We build shuttering and then pour in the mix. Once it starts to set, we float it to level the stones in the mix. This creates a smooth, yet non slip surface. 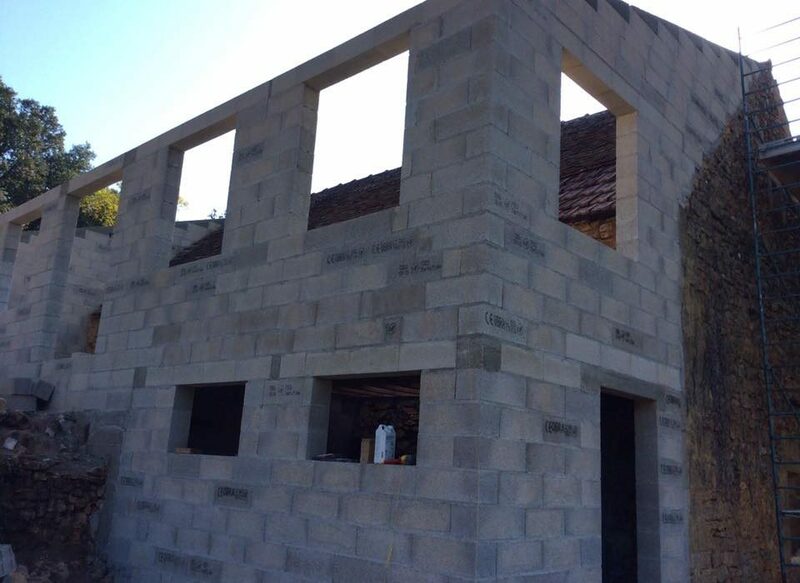 Once the concrete is fully set we remove the shuttering, polish the edges and make expansion cuts. The last stage was to tile and grout the pool. 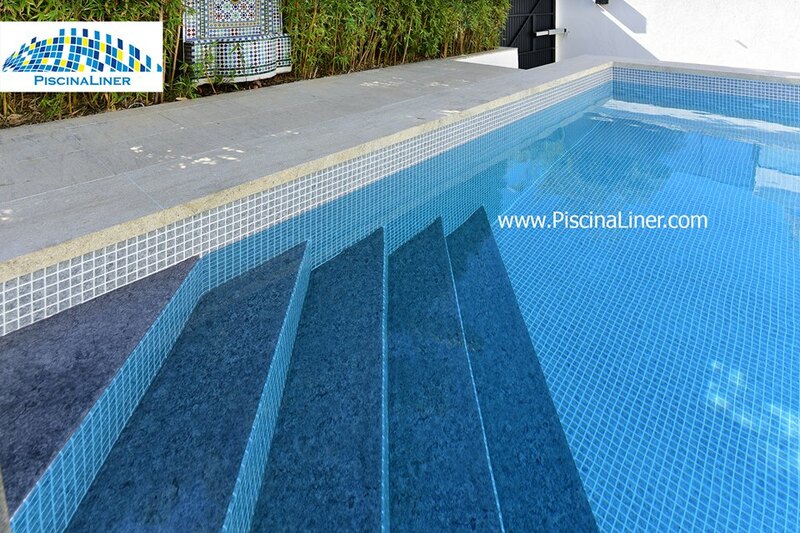 In this pool the choice was high quality AlttoGlass mosaic tiles from the North of Spain. As you can see, the results of this 5 day project are stunning. 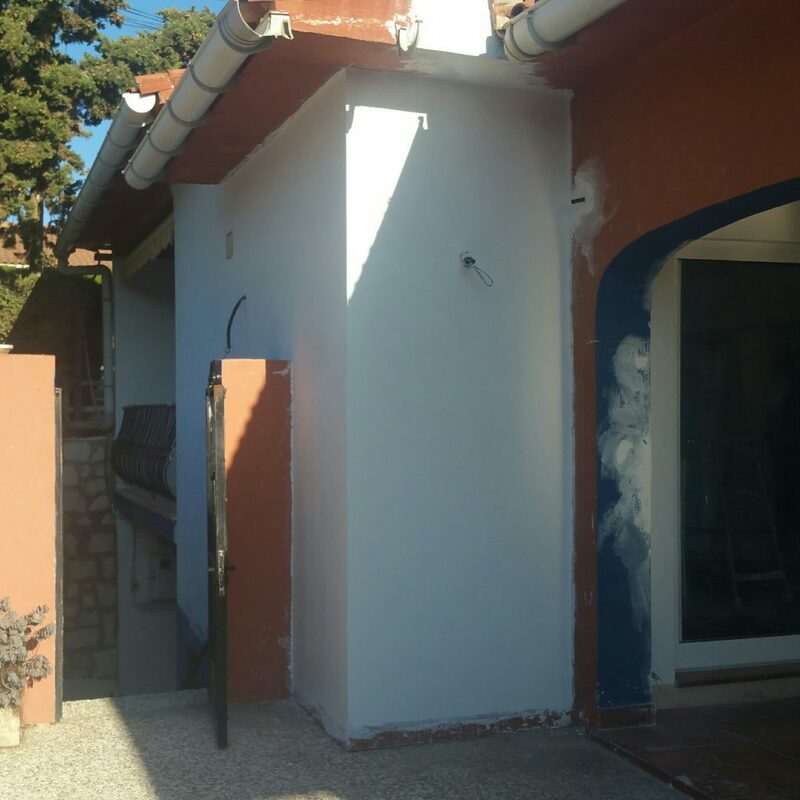 This villa was built in the 1970’s and is in need of modernization. 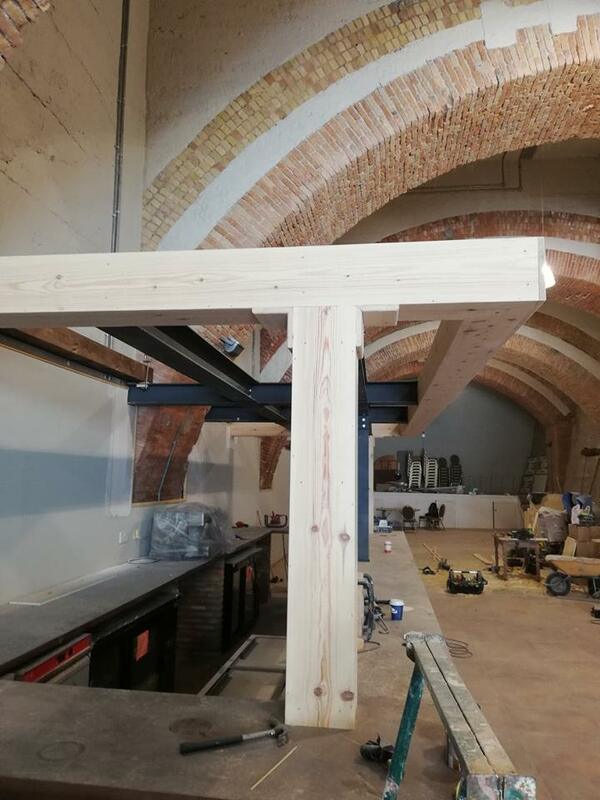 In the interior, all of the walls have been plastered, new floors with high quality ceramic tiles, new kitchen, totally rewired etc. 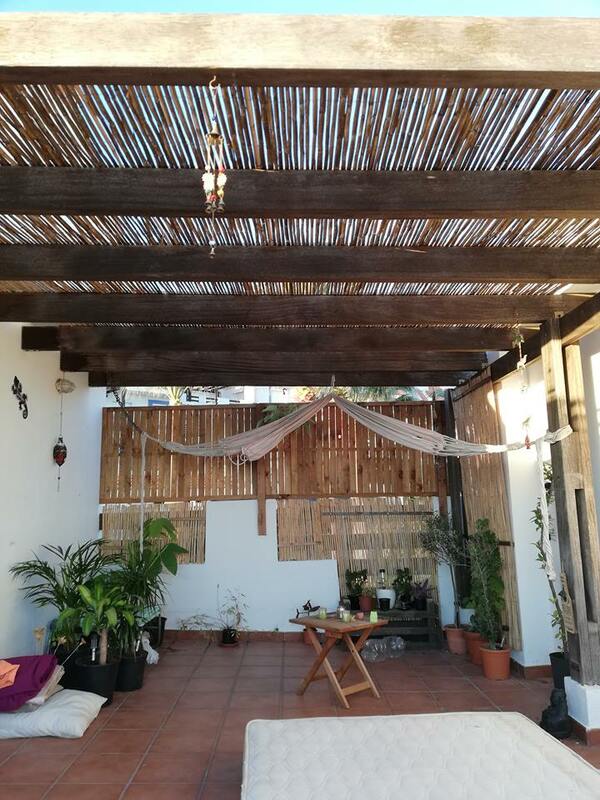 Later on, the terrace will be tiled and the cracked pool repaired and renovated. We have taken these photos to show what a radical transformation can be achieved for something so old fashioned. The walls of this house are clad in clay bricks. 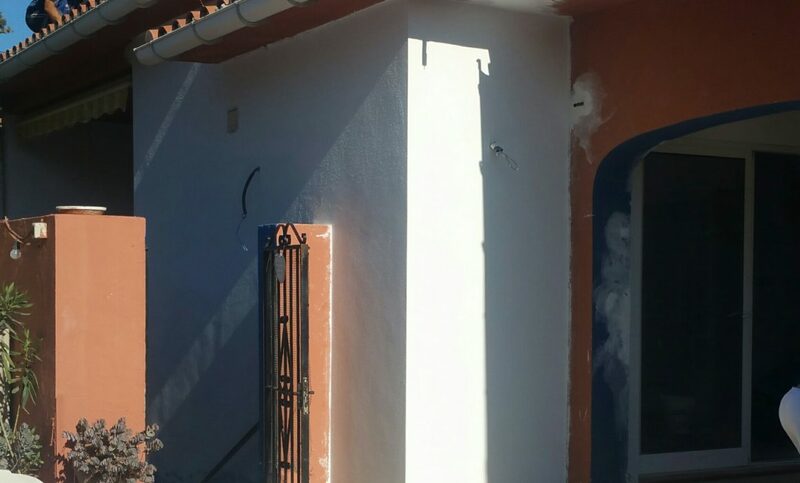 We have applied a bonding agent, then a cement based glue, followed by a waterproof render. First stage of the process is to apply a bonding agent. 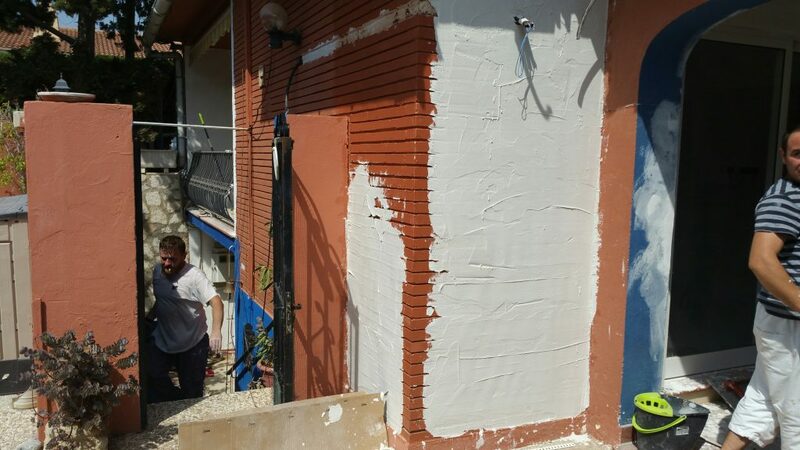 Once the bonding agent is in place a rough first coat of render can be applied, this builds up the depth. 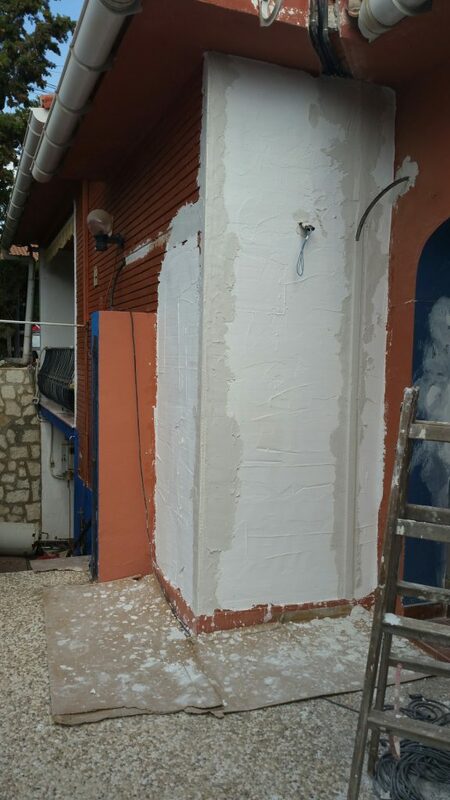 Third stage, here the corner profile is in place and to the right hand side, a strip of render has been applied which is perfectly vertical to give a guide for the final coat of render. Here, the finished result. 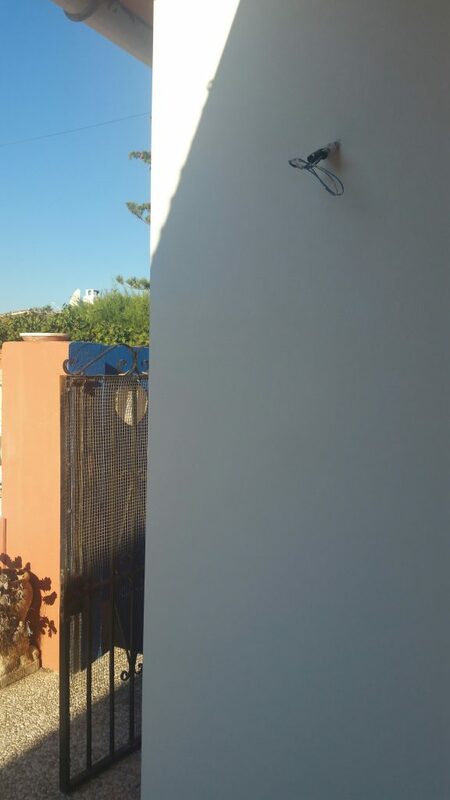 A perfectly smooth, flat and clean looking wall. Imagine the transformation to the entire house. 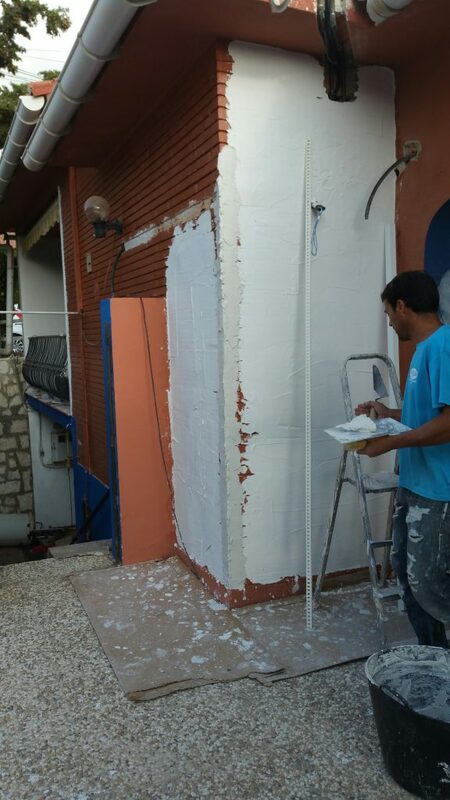 Once the whole house is rendered outside, it will look fresh and modern, all the 70’s details gone. 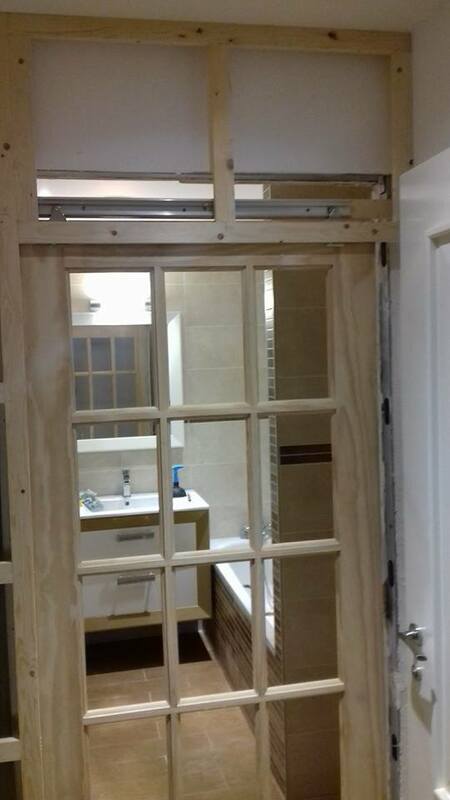 If you are planning build works, contact us for a no obligation quote.